Yep, I did…… I used the wrong paint color. I hoped to have a furniture project to share with you guys today but that didn’t happen. Note the photo above. The furniture project involves fabric. In fact I used the same fabric in a prior project. Some of you may recognize it. The is the project if you want to click over and take a look… Bold and Fancy Yellow Chair. Anyway, back to the photo above. 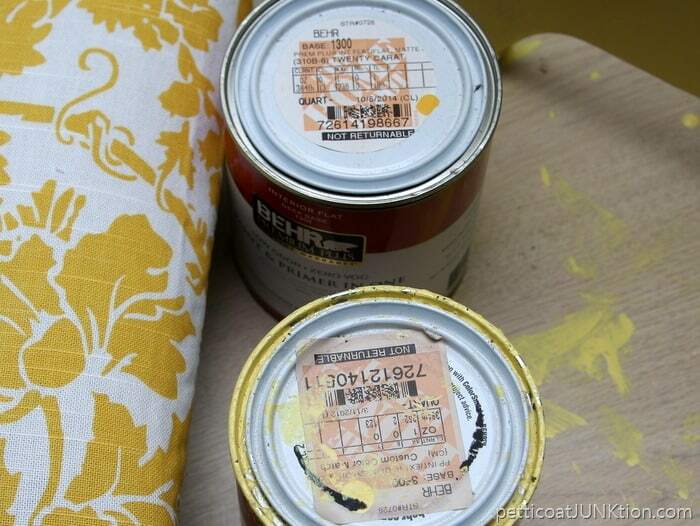 When I started the project I went through my three shelves of paint cans and found a can of yellow paint that I thought was the right one. I didn’t even know I had more than one can of yellow. 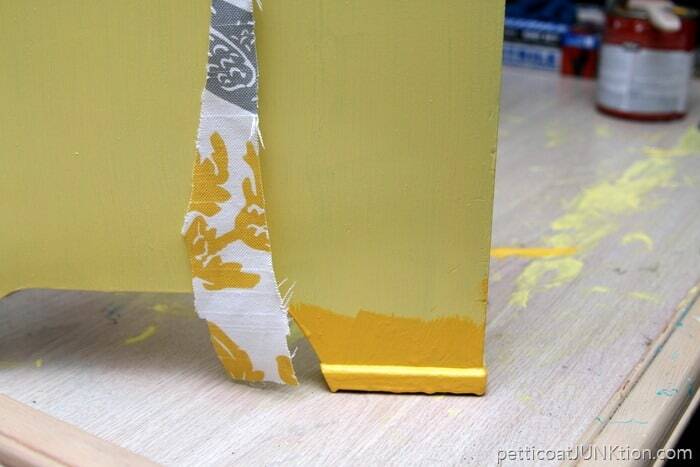 The paint can at the bottom of the photo is what I painted my furniture piece with. I put 3 coats of paint on that thing! I covered the seat that goes with the project (don’t want to give away the whole project yet), and laid the seat beside the furniture waiting for the last coat of paint to dry. That’s when I noticed the problem. I looked at the fabric and looked at the painted furniture and looked again…..then went ……ggggrrrrrr. 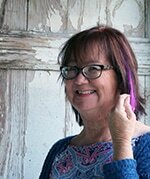 See, I had paint mixed to match the fabric when I did the prior makeover. This paint didn’t come near to matching. I went back to the paint shelves and found the correct paint…..the one at the top of the photo. Guess what. Now the furniture is covered with 4 coats of paint and I’m hoping that does it. Anyone else ever used the wrong paint? Please tell me it’s not just me. Another learning experience. 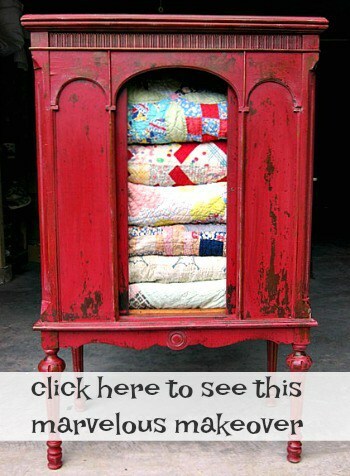 update: You can see the finished project here…..How To Recover A Vintage Dresser Stool. Thanks for being here. I love you guys. Have a great day! Mistakes give good experience so making mistake is not bad. Kathy, I love how honest you are! You make me feel so much better about my own trials and errors with my projects…. 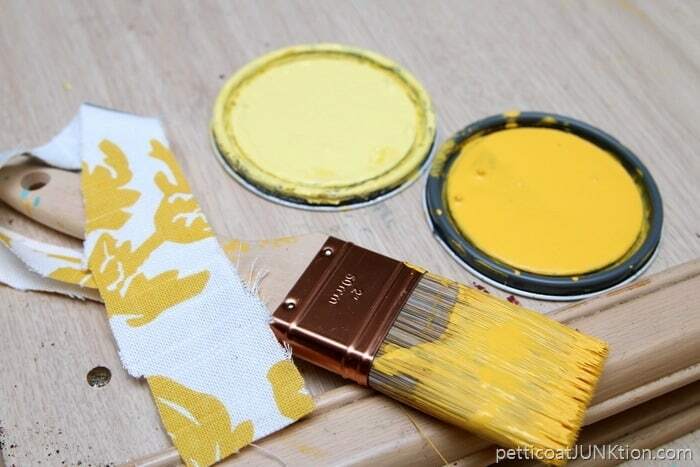 and by the way I thought I was the only one who liked latex paint better than chalk paint until your post. I feel empowered now! WooHoo! Woman DIY Power! Most of my projects involve mistakes and miscues! Hit a key too fast!!!!!! Rest of the story: I repainted the closet when he was away from the house and we never mentioned it again. The sun still comes up in the morning, kathy. And you learned something. All’s well in the end, right? OH yes, I got up one Sat. morning and my husband wanting to surprise me by painting my small bathroom for me. I went out to look and OMG, it was the wrong paint. I thanked him for doing it, but then told him he used the wrong paint. It was a shock. Now I don’t feel so bad about my little mistake! These things happen. Hope you weren’t too hard on him! Oh yes. Recently, the black I opened with the name “Cannonball”, was definitely not the black I expected! More gray black than black. So now I’m thinking what can I do with it… and back to pick out black! Kathy, you are my hero and you are forgiven! I enjoy your creativity so much!